Tulbaghia violacea growing herbaceous geophyte of the genus Tulbaghia also known as Society garlic or Pink agapanthus, Tulbaghia violacea perennial evergreen plant, edible plant but mostly used as ornamental plant cut flower fragrant, can grow in mediterranean, subtropical or temperate climate and growing in hardiness zone 7-10. Leaves edible color green or variegate green with white, leaf narrow and hollow grow in radial structure, leaves grow in groups linked together. Flowers fragrant small the color is pink-purple, the flower grow on stem as inflorescence in a umbel shape. Bulb edible small in the color white-yellow. 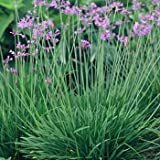 New Tulbaghia violacea - garlic, SOCIETY GARLIC, perennial flower, EDIBLE, 15 seeds!